For those of you who like SB on Facebook, you may have seen my post last week about the most amazing tacos I’ve had in quite some time. Well folks, these are the tacos I was referring to! It’s not a secret that I love tacos, sammiches, burgers, etc. and I haven’t met many that I don’t like, but it isn’t often that I come across one that just knocks my socks off like this one did. I made a couple of tweaks to the recipe I used and I think it made an incredible difference. The marinade was awesome already, I just added some orange zest to it, and then while the steak was cooking, I decided to cook the marinade down into a delicious sauce for the tacos. The meat soaked up the marinade flavors very well on it’s own, but the added marinade sauce just kicked up the flavor a leetle bit more. And of course the chimichurri was amazing. J asked what kind of steak it was or what was in the marinade or something along those lines and when I told him what I’d added he said he could definitely taste the orange zest and he thought it was a great addition. ::swoon:: I love him. Just as much as I know you’re going to love these tacos. In a medium bowl, combine the orange juice and zest, lime juice, soy sauce, olive oil, sugar, cumin, chili powder, garlic and cilantro for the marinade. Whisk together until well-combined. Place the steak in a large resealable plastic bag and pour the marinade in on top. Seal the bag and turn to coat the steak well. Allow to sit at room temperature for 30 minutes to an hour. If you would like to marinate longer, refrigerate for up to 3 hours, but bring it back to room temp before grilling. Preheat your grill or grill pan over medium-high heat, remove the steak from the marinade – reserving the marinade – and cook the steak for 3-5 minutes per side, or to your desired doneness. Remove to a cutting board and allow to rest for about 10 minutes before slicing thinly against the grain. Meanwhile, place the reserved marinade in a small saucepan over medium-high heat. Bring to a boil and then reduce to a simmer for about 5 minutes (or more if necessary) until reduced and slightly thickened. 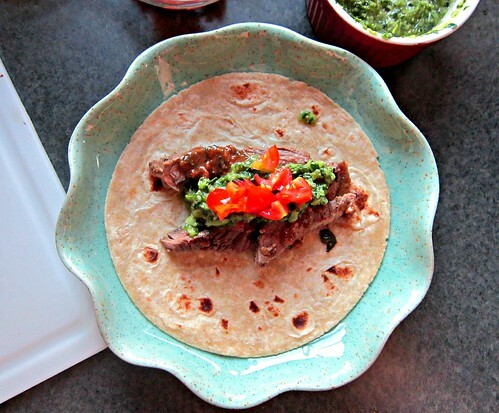 To prepare the chimichurri sauce (either while the steak is cooking or while the steak is marinating) add the jalapeno, garlic, and onion to a food processor and process on low until coarsely chopped. Add in the cilantro and Italian parsley and pulse again until finely chopped. Finally, add in the oil, lime juice, cumin, coriander, and salt. Process until well-combined. 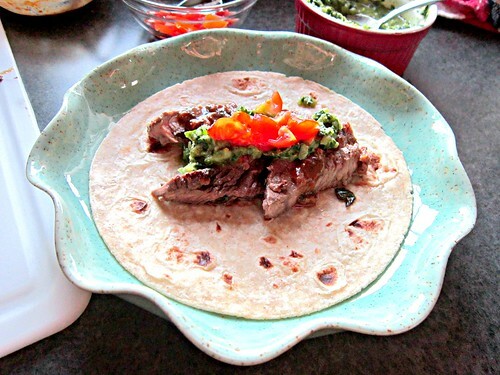 To assemble the tacos, warm the tortillas and top with a few strips of steak, some of the marinade sauce, a spoonful of chimichurri, and a spoonful of diced tomatoes. Yum! 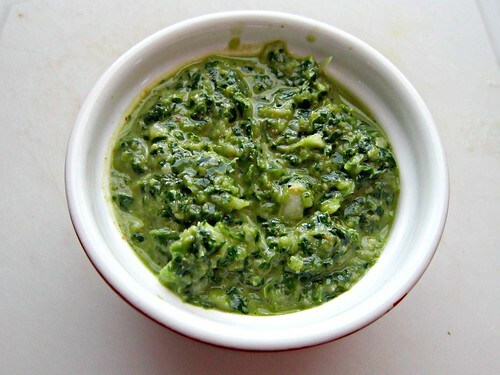 Chimichurri is a great addition to pretty much anything. As an aside – CUTE PLATES!